Emile Galle and the Lasting Appeal of Art Nouveau Glass | Skinner Inc.
First introduced in the latter half of the 19th century, Art Nouveau glass was a completely new kind of art form for its day. Modern, bold, original, innovative and flamboyant, the Art Nouveau style was a complete departure from the art forms of the Victorian era. Art Nouveau artisans, such as Emile Gallé, drew on the free- flowing motifs of nature to create some of the finest examples of art glass ever made. 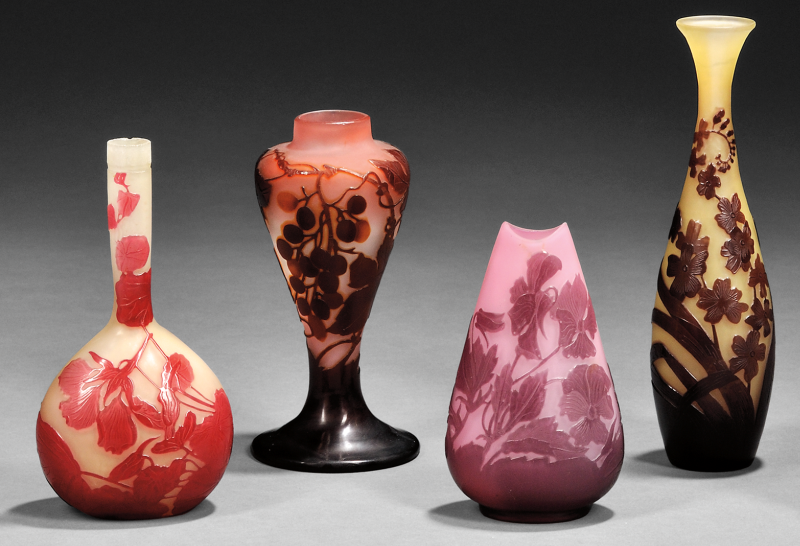 Art Nouveau glass peaked in popularity from 1890-1910, but even now, over a century later, it continues to delight collectors and is gaining popularity once again. What makes Art Nouveau Glass so timeless in its appeal? I feel it’s a combination of the material, the techniques used in making the glass, the form, and the decoration. The Art Nouveau style has inspired many master glass makers around the world: Thomas Webb in England, Louis Comfort Tiffany in America, and the Daum Brothers and Emile Gallé in France. A comparison of how these artists interpreted the art Nouveau style can be seen in the photo gallery below. In this post, we’ll focus on Emile Gallé. Gallé and his artisans produced a body of work that distinguishes itself as quintessential French Art Nouveau glass. Emile Gallé (1846-1904) saw glass as a medium through which to express his aspirations and vision. Cameo glass is one of Gallé’s most beautiful creations, and after his death, the artisans from his studios continued to produce this form of Nouveau art glass. Cameo glass is made by layering multicolored glass, then engraving or etching through the layers to form a raised decoration or “cameo” effect. This technique was popular on vases, covered boxes and various other decorative forms. Emile Gallé exhibited cameo table lamps and chandeliers at the Ecole de Nancy Exposition in Paris, France in 1903, delighting viewers with this modern form of illumination based on naturalistic decorative forms. The Gallé workshops closed at the beginning of World War I. The cruel realities of war dampened spirits and the economy, reducing the appeal of inspirational Nouveau (new) glass. After the 1918 armistice, Art Nouveau glass had a short period of revival that ended in 1931 when Gallé’s firm closed. I’m glad to see collectors once again paying attention to this important decorative art. The upcoming auction of 20th Century Furniture & Decorative Arts features a large selection of Gallé Cameo Glass as well as an elegant example of Art Nouveau glass by the Daum brothers. This entry was posted in Blog and tagged 20th Century Design, art glass, art nouveau, Art Nouveau glass, Art Nouveau style, Daum brothers, Emile Galle, Galle Cameo Glass, History of Art & Antiques, Jane Prentiss, Louis Comfort Tiffany by Jane Prentiss. Bookmark the permalink. I’m looking to replace a lamp recently broken. 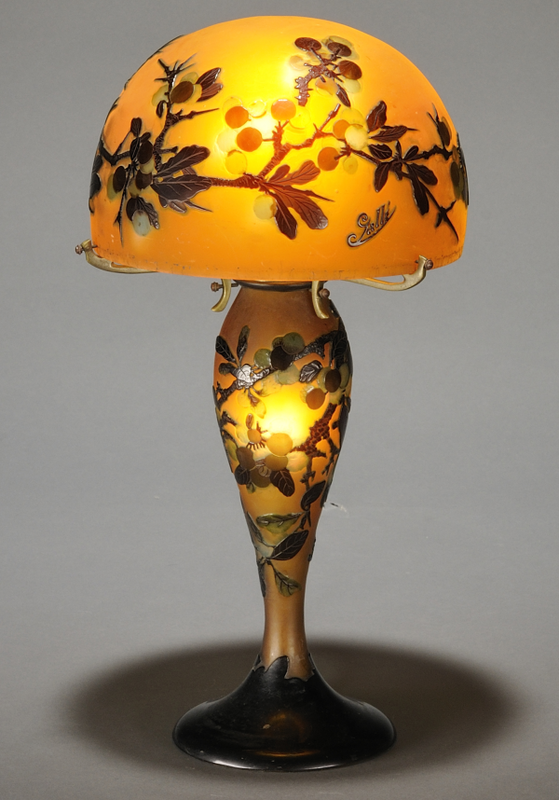 It resembles the Galle cameo glass table lamp in your article. However, it could have been Daum or another studio. Can you guide me to some reliable sources? I would appreciate your help. We wanto to reproduce your images of four glass container by Gallée that you post in your blog, in a book about a mexican author that wrotes about Tiffani store an the Gallée pieces he found there circa 1900, ¿It is possible to use it or it has reserved rigths? Very nice post and useful information. I’m happy that you simply shared this useful information with us.